I'm still abundantly proud of my Creamy Mac n' Cheese recipe (in Pudge-Free Holidays) that's fat-free and calls for whole wheat pasta.It's.just.so.tasty! If you own Pudge-Free Holidays, you know that mac n' cheese is traditional holiday fare for my family and that everyone loves my healthier vegan version. The problem? My mom can't dig in with us. She can't have soy because of her thyroid issues and that makes me sad. Nothing makes me more proud than when my own mother loves my cooking, so I knew I had to create a vegan mac she could eat. I just know my mom will love this vegan mac -- I sure do! It also comes together in a snap, showing up all those commercial boxed varieties that homemade and wholesome is just as quick and easy! 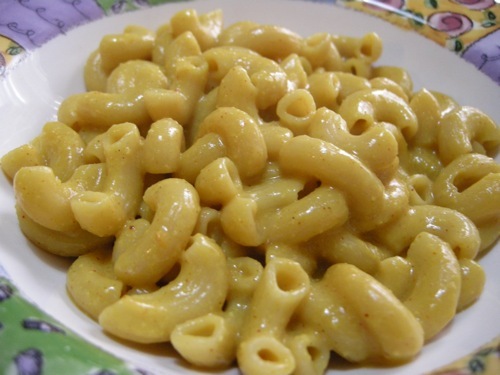 A quick and easy vegan mac n' cheese that doesn't use tofu -- or fat! Miso can have soy in it, so be careful when selecting your miso if you have an allergy or dietary need (chickpea miso is soy-free!). You can also make this dish gluten-free by using brown rice macaroni. Cook pasta according to directions, immediately drain, rinse with cold water and set aside. Whisk all remaining ingredients (plus salt and pepper to taste) together in a saucepan over medium heat. Bring to a near boil and turn heat down to low. Stirring occassionally, allow the sauce to thicken up. Combine with macaroni, stirring to coat. Garnish with smoked paprika if desired.